Sri City, March 25, 2016:- In a ceremony held on Friday, the Chennai based Sankara Netralaya broke the ground marking the commencement of construction work for the Institute of Occupational Optometry and Visual Sciences. Prof. P.P. 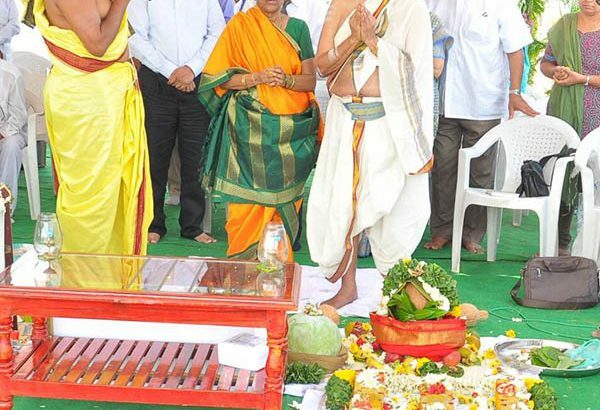 Santanam, who is is considered as the ‘Father of Occupational Optometry in India’, performed the bhoomi pooja and laid the foundation stone in the august presence of Mr. B. Santhanam, President and MD, Flat Glass-South Asia, Malaysia & Egypt, Saint-Gobain India Private Limited, S. Chandrasekar, Director, International Infrastructure Consultants, Dr S. S. Badrinath, eminent ophthalmologist and Chairman Emeritus of Sankara Nethralaya, Mr. Ravindra Sannareddy, Founder Managing Director, Sri City and a host of donors, volunteers and senior ophthalmologists and staff of Sankar Netralaya. 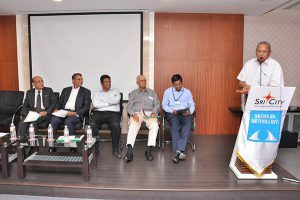 Stating that Dr. Badarinath’s motto is ‘I care for eye’, Mr. S. Chandrasekar wished that the partnership between Sankara Netralaya and Sri City will result in a grand success in their endeavour. Wishing that the institute will set a new landmark not only in the country, even in the entire world, Mr.
B. Santhanam said, “Setting visual standards at workplaces is very important, and I am sure that the institute will bridge the great gap that exists in the industries towards occupational visual safety.” The Occupational Optometry institute, which is first of its kind in India, will be built in a plot of 5 acres, and is expected to be ready within two years. The institute will offer Education, Awareness services, Research and clinical care.